This release (2017 reissue) is taken from the later recut (198?) (NOT from the original release)! Jacket is solid, and graphic transfer looks best of the three newer Tad's I have, but it's also the easiest to reproduce. But definitely a cheaper digital transfer. Tracks on this LP are phenomenal, and among the best in the Tad's catalog. Very diverse, and out-there Dubs. Few LPs sound this varied and original. One of the best IMO. Probably the best sounding of the three of these issues I own. Good staging, separation, loud, good detail. Still lacks OG Tad's bright-open sound, but that's unavoidable. For what it is, this one is very enjoyable. 7.5/10. Great pressing but the spine of my cover lists “Gregory isaacs - year lonely lover” has anyone else got this? 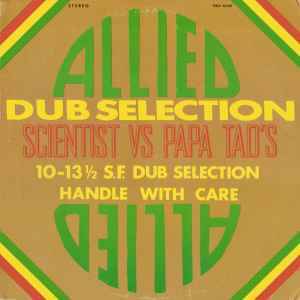 Exactly what you'd expect on a 1980 Scientist dub album: ultra-strong rhythms and an entertaining Scientist mix. Backed by Roots Radics and edited at Wackie's!!! OUT OF CONTROL!! !